Transferring files from an iPhone to a computer or vice-versa is possible with iTunes but could generate some problems. For example, you wish to transfer your photos, videos or some other files from your computer to iPhone, you’ll first have to import them to iTunes library and then sync with your device. This process can cause some data loss if you have non-purchased music on your iPhone. Problems like this and others can occur which can leave you with the option of opting for better software. And what kind of software does this best – Third-party software? 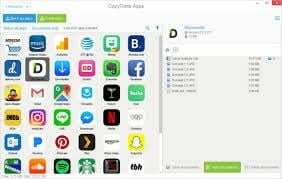 Here in this post, we’ll be discussing 5 third party software that can be used to transfer files between your iPhone and computer giving you an advantage over using the traditional iTunes. A highly rated software, Syncios iPhone Transfer allows you to transfer files between your iPhone and computer. It also supports transfers with phones of other OS like Android. Syncios iPhone Transfer has a free version as well as a paid version. The Ultimate version of the software is the paid option which offers you the ability to restore iCloud and iTunes backup and also synchronize with iTunes library. With Syncios iPhone Transfer, you can transfer many alternative file categories. Images, music, videos, ebooks, audiobooks, contact list, apps and many more are all supported for transfer on Syncios iPhone Transfer. AnyTrans can achieve the transfer of iOS files and content across multiple devices. You can transfer files between iOS devices, iOS devices & computer, iOS device & iTunes, and iOS device & iCloud. Various types of files are supported including photos, videos, music, contacts, messages, voice memos, voicemails, notes. You can even transfer some backed up data via iTunes/iCloud that are not supported, such as non-purchased music, ringtones, movies. TunesMate is a straightforward software that allows you to quickly transfers files from or to your iPhone. You can also transfer files from iPhone to iTunes directly or vice-versa. By dragging and dropping, you can transfer music, videos, photos, ringtones, podcasts, audiobooks and playlists from your computer to iOS devices. An interesting thing about TunesMate is that transfers using this software are very quick and straightforward, and it allows you to bypass many of iTunes file transfer restriction. TunesGo can replace the traditional iTunes as it enables you to have easy access to all your files. You’ll get relieved from all the restriction by the tools that Apple provides. TunesGo allows you to delete, view photos or convert photo. You also have the ability to delete unwanted files and duplicates music on iPhone. With CopyTrans, transfers are possible between many iOS devices and your computer. You can also restore your iTunes library from iPhone and copy your iPod files to iTunes in one click.